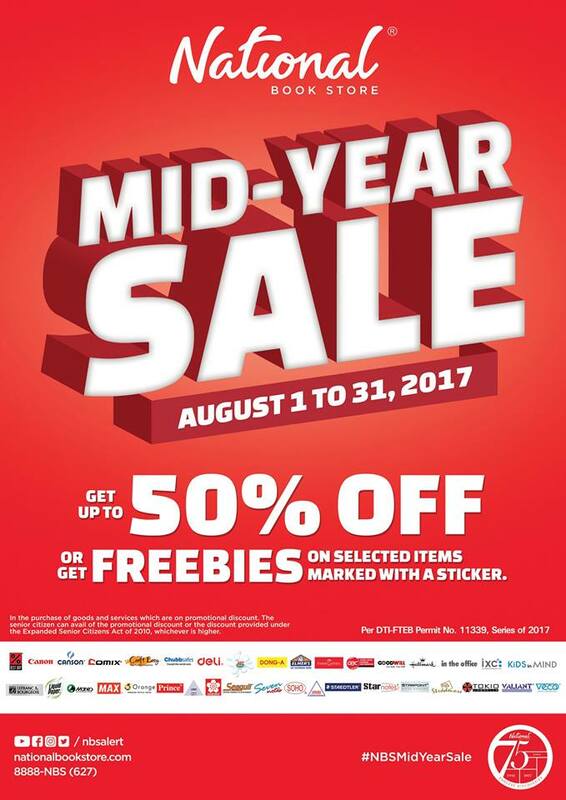 Home Promo National Book Store Midyear Sale: Up to 50% Off!!! 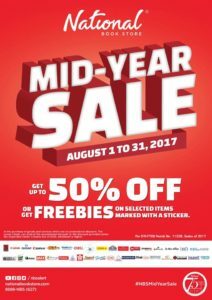 National Book Store Midyear Sale: Up to 50% Off!!! Do some early Christmas shopping and stock up on great gift items with National Book Store’s Midyear Sale! Get freebies or enjoy up to 50% off on selected Christmas items, books, gifts, as well as school and office supplies tagged with a sticker. Comix, Pyramid, Deli, Faber-Castell, Dong-A, Best Buy, Sakura, Disney Art Attack, Craft Easy, Hallmark, Max, Color & Co, Maries Willow, Canson, Orange, In The Office, Inoxcrom, Steadler, Seagull, Soho, Canon, Sonoma, Stradmore, Star Notes, Seven Notes, Liquid Paper, Starpoint, Elmer’s, GBC, Valiant, Canon, Veco, Prince, and Tokio. Promo runs from August 1 to 31, 2017 in NBS branches nationwide! Next articleFirst Thursday: FREE PIZZA from Domino’s Pizza!! !